COLLEGE STATION — Despite recent storms, most of the state — and large parts of its cotton-growing regions — remained under severe to extreme drought conditions, according to the U.S. Drought Monitor. In many areas, there hasn’t been enough moisture for cotton farmers to plant. 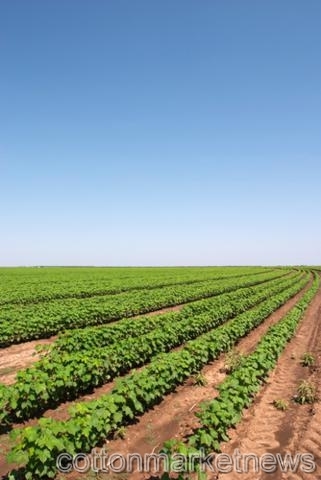 In South Texas, the situation is mixed, with some plantings completed and some delayed as farmers waited for enough soil moisture to risk using expensive seed, according to Dr. Gaylon Morgan, Texas AgriLife Extension Service state cotton specialist, College Station. Though they didn’t get the rains that parts of Texas got from April 25 storms, many upper Gulf Coast farmers are in the fields again because they’re coming up against their planting deadline, Morgan said. “The other thing that is going on with the high winds is that a lot of these young cotton plants are getting beaten up — sandblasted,” he said. Everything else is pretty much on hold, as far as planting goes, including the southern Blacklands. For some, as in the Blacklands, it’s the lack of moisture that has made farmers hold back. In the Rolling Plains, South Plains and Panhandle, the typical beginning planting date is not until May 1, Morgan said. “So the drought has not delayed planting for these major production regions yet, but the producers do not have any subsoil moisture and are quite concerned as time planting approaches,” he said. Morgan said that during a Texas Cotton Producers meeting he attended last Monday, the consensus was that drought or no drought, cotton acreage was still going to be up, just because prices are so high. Central: Some parts of the district received significant rainfall over the weekend while other parts remained extremely dry. Drought conditions were beyond critical. Spring grasses were stressed to the limit. Warm-season grasses dried down, and there was no regrowth after being grazed. Trees and landscape plants that were not being watered were stressed. Livestock producers were supplying heavy amounts of supplemental feed to cattle. Coastal Bend: Continued extremely warm, dry and windy weather stressed cotton, corn and sorghum. High winds compounded the poor soil-moisture situation by beating the withering field crops. Dry conditions hindered further plantings and were jeopardizing yield potentials. Pastures were also showing the effects of the drought. Bluebonnet season has come and gone with very little show compared to the usual fanfare. Livestock producers continued to supplement cattle with hay and protein. East: Drought conditions worsened. Most counties received no rain by April 24, but those that did had only light showers that made no real impact on soil-moisture levels. Windy weather further dried out soils. Pastures were very short, and many stock ponds were going dry. Cattle were beginning to show the signs of stress from lack of quality grazing. Producers were culling herds. Only irrigated vegetable crops made progress. Henderson County’s peach crop was reported to be poor due to lack of chill hours this winter. Most counties were under burn bans. Far West: The region was very dry and windy. Pecan trees came out of dormancy and were flowering. Fall-planted onions had poor stands, probably due to a freeze in February. Farmers began planting cotton and chiles. Some were planting sunflowers on drip-irrigated fields. Wildfires in Jeff Davis County were still burning, but about 70 percent contained. Fires in Midland County were contained with little or no loss of livestock. However, there was significant damage to fences. An estimated 90 miles of fencing will have to be replaced in Midland County alone. North: Soil moisture ranged from short to adequate. Rising temperatures and persistent winds drained soils of moisture. Many livestock producers wanted to plant pasture grasses this spring, but weather conditions were not favorable. Topsoil moisture was adequate, but subsoil moisture needed replenishing. The lack of rain and high winds delayed planting. Some areas received rain, which helped save some crops and pastures, Unfortunately, hail accompanied the rain, which damaged about 10 percent of wheat, corn and sorghum stands. The unusually high winds were particularly hard on corn, drying the topsoil and shredding upper leaves or laying over stalks. Otherwise, corn looked good in areas that received rain, but where there wasn’t rain, it was not growing at all. The same applied to wheat. Later-planted corn entered the grain-filling stage, while earlier-planted fields were entering the dough stage. About 70 percent to 75 percent of grain sorghum and soybeans were planted. Sunflower planting was completed, and cotton planting was nearly complete. Pasture grasses were short and not growing due to low moisture. Ryegrass finished growing and had headed out, but stands were short. The first cutting of hay was expected to be lower than normal, but, weather permitting, some producers were planning to start baling the last week of April. Livestock were in fair to good condition. Some producers were feeding hay, but supplies were very short, forcing livestock to eat a lot of weeds. The insect population was increasing, and feral hogs remained a major problem. Panhandle: The region remained very dry. Soil-moisture levels were very short to short, with most areas reporting very short. Farmers continued to prepare land for spring plantings. Corn and peanut plantings were under way. Dryland wheat was in very poor condition. Irrigated wheat was in fair condition. Rangeland was mostly in very poor condition. Supplemental feeding of livestock was ongoing. Rolling Plains: Conditions remained dry and windy. Wildfires were burning in several counties. Palo Pinto has been the site of devastating wildfires during the last week. Fires are were only 25 percent contained at the time of this report. The federal fire service took over operations. There was extensive loss of pastures, rangeland and livestock. Wildfires ravaged about 55,000 acres in southeast King County. In Stephens County, more than 50,000 acres burned, mainly native and improved grasslands. At least five homes burned and 20 to 30 cattle died, and many miles of fencing were lost. In Clay County, about 20,000 acres burned. About 4,500 acres burned in the southern part of Young County. Crop-wise, wheat was in sad shape. Most producers have abandoned hopes of harvesting the crop for grain and turned cattle onto it to graze. Stock-water tanks were getting very low; some were already dried up. Cotton producers needed rain to plant. South: Temperatures 100 degrees and higher, persistent high winds and the lack of rain continued to cause rangeland and pastures to decline and raise the specter of wildfire throughout the region. Soil-moisture levels were short to very short. As pastures rapidly declined, ranchers increased the feeding of hay and molasses, as well as alternative feeds such as prickly pear. They also were culling young calves at a high rate to take the stress off cattle before they lose too much weight. Farmers were heavily irrigating crops in Frio County. Jim Wells County’s crops were stunted. In Zavala County, cabbage, corn, onions and cotton progressed well under heavy irrigation. Also in that area, a limited number of fields of late fresh-market spinach were growing well, and the harvesting of carrots was completed. Citrus and vegetable harvesting continued in Hidalgo County. Grain sorghum in that area showed signs of drought stress. South Plains: Most counties saw continued dry conditions, high winds and above-average temperatures. Burn bans were in place in all counties. Farmers across the region were watering fields in hope of having enough moisture to plant. Wheat continued to decline. Fields were being released by insurance adjusters to salvage some grazing from the crop. Rangeland water-tank levels were dropping, and cattlemen were concerned about water shortages in addition to grazing losses. Southeast: Drought conditions and high winds continued. Ponds and lakes further dried out, and water for livestock was predicted to become an issue in some counties. Ryegrass was browning and stands fading. Warm-season forages were not growing. Cotton was in poor condition. Many farmers only completed about 85 percent of their cotton planting. Water for rice irrigation was very limited. Fort Bend County was extremely dry as well. Only irrigated crops were progressing. Wheat was also suffering from drought-stress. Despite hay still being fed due to the drought, livestock were losing body condition. Southwest: The region remained completely dry, with nearly 60 days since the last rain of about 0.2 inch. Red alerts continue to be issued throughout the region with flashing signs banning open fires and warnings of extreme wildfire risk. Hot weather with mid-afternoon temperatures in the low 90s and high, dry winds increased the risk of roadside and field fires. San Antonio was in Stage 1 water rationing. Spring wheat under irrigation made good progress. Irrigated corn, sorghum, peanuts, sunflowers and cotton were all doing well, but dryland spring crops failed. The harvesting of cabbage, lettuce and spinach began to wind down. Onions, cantaloupes, watermelons, green beans, potatoes and sweet corn made good progress under heavy irrigation. Pastures and rangeland grasses remained brown and dormant. Forage availability was below average. West Central: Hot, dry, windy conditions continued, making the danger of wildfire extremely high. Fires continued to break out and spread across the region. A few areas have reported spotty showers, which may lower the risk of wildfires somewhat and aid spring plantings. Most small-grain acreage has been released for grazing by crop-insurance adjusters. Rangeland and pastures were in poor condition. Stock-water tank levels were critically low. Livestock producers were still having to provide supplemental feeding due to poor foliage quality. Some were selling off livestock in order to decrease stocking rates. Pecan growers were working in orchards.